The Priest Campaign: Second Rate Paladins? A pain-medication addled Pants once said “Priests are like lamer paladins”. While my love of the paladin class is pretty insurmountable, I probably wasn’t being completely fair in my assessment; even I have to admit that Discipline is pretty intriguing and Shadow’s class fantasy can’t be beat. And, I certainly didn’t want Blizzard to agree with me. Unfortunately, it seem like that is exactly what they did. Over the weekend, I finally sat down and finished up the Priest Order Hall Campaign. I’ve done quite a few of the class hall campaigns now, but I have to say, this one ranked among the… least well done. And that’s putting it generously. Firstly, there was the artifact quest chains. The Shadow quest chain was fine, I suppose, but having it take place in the same location as the holy paladin one (especially because I did the paladin one first) made it come off as a rehash. However, there was bits of good lore there so, overall, I thought it was the strongest of the three. The Holy quest chain was, quite frankly, forgettable. There was no ‘hoorah, I’m a priest, biyotches!‘ moment; it felt like a run of the mill side quest. The Discipline quest though, hoo boy. I guess that series was my first warning sign of what was to come. Not only was it poorly done, it didn’t even seem to connect to priest lore in the slightest. Why am I going to the Nexus for a holy weapon? Isn’t the Scarlet Crusade involved in this one? The strange and ill-suited tie-ins to the balance between the Light and the Void, too, were thematically out of place with the rest of that strange, strange questline. The whole experience was just… discombobulated. Alright well, I have my weapons now, maybe it gets better from here? But no, no it doesn’t. What follows was a series of quests in which I flew all around kingdom come, gathering an army of generic and uninspiring “champions” that perhaps were big figures in priest lore, but I’d certainly never heard of them. Something about some void lady? Also, randomly saving a member of the Scarlet Crusade (I guess I finally got my crusade on). And murlocs?? There didn’t seem to be any clear motivation or end goal. Somewhere in the middle of that mess, Velen pays a visit to the class hall and starts spouting words of wisdom. Now, I’m generally a big Velen fan, him being the leader of the draenei and all, but I don’t think he could have been more unhelpful if he tried. He literally shows up, tells us some run of the mill prophecy, and peaces out again, leaving poor Alonsus Faol to worry about the implications of the predictions. And worry he does, the man spends the rest of the campaign wringing his hands about it. We haven’t even gotten to the good part yet. No, at this point, as lame as it is, I suppose the priest are still somewhat self sufficient. That very quickly goes out the window. The Legion, who’s been hunting down our homebase, the Netherlight Temple, for millennia apparently, discover where the priests are hiding out and prepare to launch an all out assault. 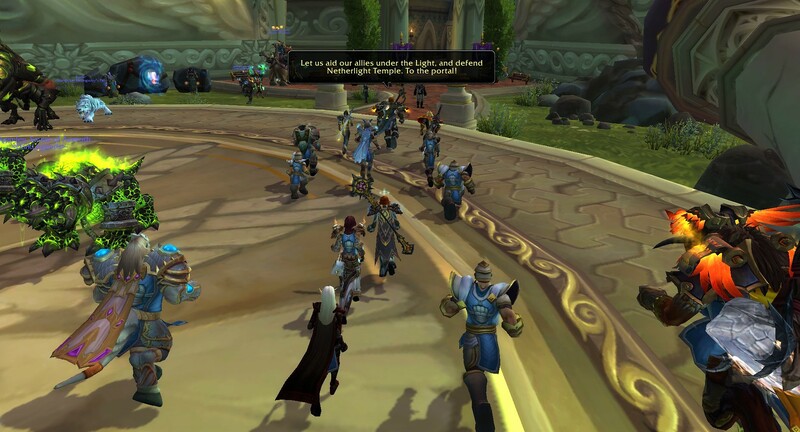 In anticipation of this, the priests mobilize… and go running straight to the paladins for help. No, I’m not kidding. Our gung-go, shining moment of class fantasy involves us cowering behind our more heavily armored brothers and sisters in plate. There’s a couple of rather demeaning quests in which you, the priest, are pretty much an ineffective bystander as the paladin class hall leaders debate if they even want to help out the priests, before deciding, yeah, we should maybe give those guys a hand. The paladins then devise the entire battle plan and effectively lead the charge, with the priest player character tailing behind like a younger sibling. The final battle is going pretty well until, surprise, the demons cheat. But never fear, the paladins are here! One of the paladin class champions, Lothraxion, jumps out of nowhere, providing the crucial interrupt, and you quickly finish off the lead demon Balnazzar. Hooray, we’ve saved the day! But really you just hung in the back and cheered as the paladins saved the day! What a big darned hero. Having done that exact same scenario on both my paladin and my priest, I have to say, it’s a wildly different experience. Rather than creating an equal partnership between the two orders, it definitely feels like one comes in to carry the other. On the paladin side, that’s pretty awesome; you go in and get to save your defenseless allies who couldn’t otherwise do so. On the priest side, it’s incredibly belittling; you can’t even defend your own temple so you end up begging your friends for help. Even I, as a die-hard paladin player, can recognize that this was not the best way to go about it. As much as I find priests to be the more boring of the two classes, they deserved a better story than that. My other big pet peeve was that the priest story pretty much seemed to be all Holy Light-based. There was lots of human and dwaren priest flavor, with a little bit of draenei thrown in there for good measure, and no one else’s. No Loa, no Anshe, no nothing other than plain ol’ light-Light. The campaign would have been a great place to delve into all the different flavors of the class, and that just did not happen. Missed opportunity in my opinion, and I even play a human priest! Going hand in hand with that, the Shadow side of the priest lore was pretty sorely underdeveloped. There was a lot of emphasis on balance and whatnot, but while it was pretty clear what was going on Light-side, the Void-side of affairs was never fleshed out. How exactly does the Cult of the Forgotten Shadows operate? Are there different flavors of void users out there? I wanted to find more shades of grey but if anything, the priest campaign almost worked to convince me that balance is overrated and the Light should be unequivocally embraced. I don’t know what happened with the priest class campaign. Did Blizzard run out of time? Did they have this grand idea that didn’t work so well in execution? Does Blizzard just hate priests? In any case, the result was pretty clear, even to me as someone who’s more of a tourist priest than anything; in an expansion based around class fantasy, priests got the short end of the stick. But hey, priest gameplay is actually pretty solid, so there is that. Where did all the furniture go? This entry was posted in World of Warcraft and tagged fussypants, Legion, priest. Bookmark the permalink.